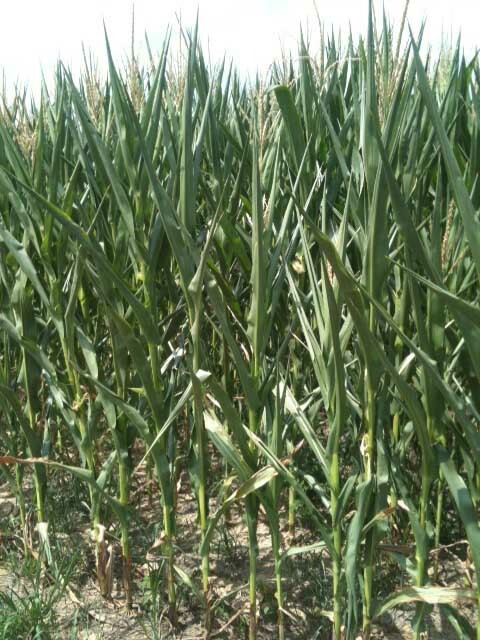 The dry weather has many producers considering salvaging the corn crop as silage. The dry weather increases the risk of nitrate toxicity. An updated set of sampling guidelines and testing laboratories are now available online. Just remember that the sampling procedure and handling of the sample can greatly influence the results of the test. Follow the guidelines as close as possible to avoid false readings from the tests. One very good aspect of ensiling is that nitrates are reduced by as much as 50% by the ensiling process. If corn is to be ensiled, then samples should be tested for nitrates around 3 weeks after ensiling. However, to get proper ensiling, whole plant moisture must be at the proper levels. According to Donna Amaral-Phillips, bunkers require fresh chop to be between 30 to 35% dry matter (65 to 70% moisture). Upright silos and bags can be a little drier at 35 to 40% dry matter (60 to 65% moisture). Farmers need to focus on whole plant moisture rather than growth stage to ensure proper ensiling this season. This means that some plants may be harvested early, with little to no grain. The lack of grain will change the feeding value If possible, corn fields at the same maturity should be cut and ensiled together. Forage analysis will be necessary on all silage this season to allow proper adjustments in final feed rations. 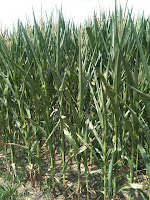 We have put together a new website to house the 2012 drought information for corn and soybeans. This drought is widespread and we have included articles from other states as well as our resources here in Kentucky. Websites that monitor the drought conditions and include some other information about weather are near the top of the page. Timely articles, including date published, from Kentucky are listed below the websites. Articles from other states come next. States as far north as Wisconsin are reporting drought concerns. Finally, there are some links to websites about irrigation and crop water use. If you know of other resources that should be on this 2012 drought website, please let me know. Thanks. Drought-stress corn in western Kentucky. Photo: June 25, 2012. Most of western Kentucky is in a severe drought status and that severity is likely to spread to central Kentucky on the next report. Most of the corn is going through tassel and pollination, which is well ahead of the five-year average, and the worst possible time to experience temperatures in the high 90's F (35 C or more). The high temperatures and low humidity dry out pollen and silks faster, both of which need moisture for successful fertilization of the ovules. In addition to the need for moisture for pollination, the corn plant simply needs more water. Corn around tasseling and silking demands about 0.3 inches (7.7 mm) per day. Most of our fields were at a water deficit prior to tasseling and the water deficit is increasing. The lack of water could lead to the abortion of kernels. Dry conditions prior to tasseling often result in the tassel emergence and pollen drop before silk emergence. In many cases, the resulting ears may have a few kernels develop near the base of the ear but very few to no kernels near the tip of the ear. Could Sugar help Drought Stressed Corn? The dry weather has farmers looking for any options to alleviate drought stress. Some are tempted to try sugar. Plants make glucose sugar through the process of photosynthesis. Crop scientists estimate that about 78 pounds of glucose is needed to produce one bushel of corn and 119 pounds of glucose is needed to produce one bushel of soybean. To extend those calculations, 50 bushels of soybeans require about 5,965 pounds of glucose and 200 bushels of corn require about 15,580 pounds of glucose. In comparison, some of the products being sold are putting on 16 fluid ounces of product. Those products contain 34% sugar, which comes out to 5.44 ounces of sugar per acre. That is a very small amount compared to what the crops require. I Hate Crying Wolf…… But Forewarned is Forearmed !! 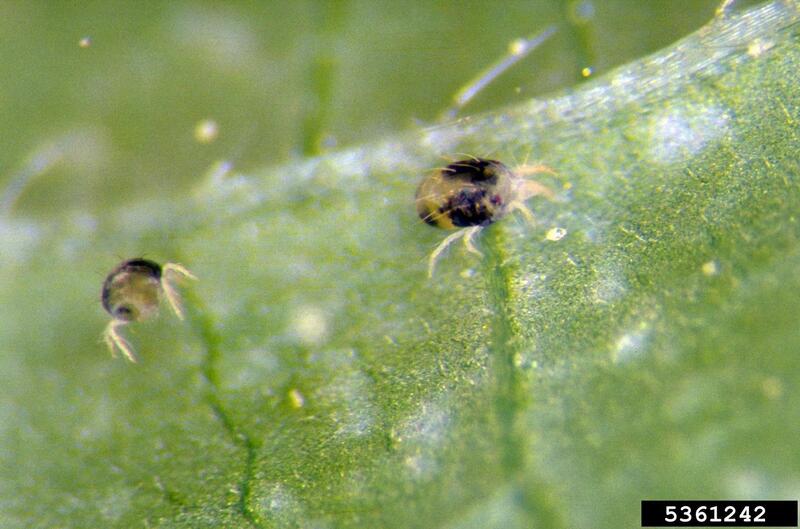 Twospotted spider mites (TSSM) are an occasional pest of soybeans and corn in Kentucky (KY). They are present every year but only important during hot, dry periods. Unfortunately, this is the type of weather we currently have and have had for several months. Additionally, states to the north of us, including Nebraska and Iowa, are already experiencing some problems. I have not received information about spider mites on KY field crops but have seen some large populations in fruit trees (different mite but same circumstances). I, therefore, think it wise for those with field crops interest to keep an eye peeled for this pest. TSSM are greenish-white with two dark spots on the back. Adults are about the size of salt grains. Juvenile TSSM have six legs, but adults have eight legs. Other species of spider mites also attack field crops. Spider mites become active early in the spring and remain active throughout the summer. They live in thinly webbed colonies on the underside of leaves. Occasionally, you will see web strands between leaves. Hot, dry weather allows rapid population growth with each generation taking about five to seven days to complete. Infestations tend to start on field margins near broadleaf weeds and/or the side from which the wind is blowing, as they may drift on a breeze. They may then spread out in ever enlarging spots if the weather allows. In corn, damage presents as yellow stippling on the upper surface of the leaves. Heavy and / or prolonged infestations may cause premature drying resulting in loss of tissue, stalk breakage and kernel shrinkage. In soybean, injury could resemble herbicide damage, foliar disease or nutrient deficiency. Feeding results in tiny yellow spots or stipples which may turn orange. Multiple damaged spots may merge in to larger areas of damage. With severe damage, leaves may turn brown and eventually fall off. Spider mites reduce yields by causing pod shattering, wrinkled seed and early maturity. Scouting is best done in times of prolonged hot, dry (low humidity) weather. In soybeans the most important time is during the reproductive stages of R1-R5 and where a synthetic pyrethroid insecticide has been used. Shake plants over a piece of white paper and look for tiny white moving specks. A hand lens is very useful in determining if the specks are actually mites. In corn, scouting is much more difficult and less is known about making a control decision. The mites are no harder to find, simply follow the instructions for soybean but using corn leaves. One simply wishes to determine if the infestation is only on the outer edges or is across the field. Large and widespread, mite infestations usually happen when hot, dry and low humidity conditions have occurred early in the season (like this year!). In these circumstances, scouting should start well before R1 (soybean) and in younger corn. Cooler temperatures and high humidity allow a natural fungus to control spider mites. Rainfall will help the plant tolerate the infestation but will not reduce the mite population. Application of synthetic pyrethroid insecticides and fungicides may worsen the infestation because these insecticides don’t work well on mites and the fungicide may hamper the natural occurring fungus that kills the mites. If direct control is required, consider using an organophosphate insecticide like chlorpyrifos or dimethoate. If you must use a pyrethroid consider bifenthrin. An application is warranted when most plants are infested with spider mites and leaf speckling and discoloration are apparent. The Corn, Soybean and Tobacco Field Day is scheduled for August 9, 2012 at the University of Kentucky Research and Education Center in Princeton, KY. The morning program will begin at 7:30 am with registration and end at lunch. The lunch is sponsored by the Kentucky Corn Growers and the Kentucky Soybean Board. The corn and soybean topics will all be discussed on the morning. Format of that program will be very similar to the wheat field days. Tobacco will have programs in the morning and afternoon. Some of the topics to be discussed are corn row widths and yields, nitrogen management, and high yield soybean. The images from field problems in Kentucky has been updated. Because the file was getting very large, you can access only the May 2012, June 2012 or the full version which includes wheat. If you access the full version, just be aware that it is 23.5 MB... and growing. The most common symptom in corn is potassium (K) deficiency. In most cases, the K deficiency is the result of root restriction. Most of the root restriction is from compaction, whether it be sidewall or sub-surface. Areas of Kentucky had ample rain during corn planting and getting sidewall compaction would have been very easy to do. The general lack of rain now adds to the problem. The compaction limits root growth, reducing the root interaction with nutrients. Water is needed for uptake of many nutrients, including compaction. The lack of water reduces the amount of K taken up by the plant. Either dry weather or compaction on their own can cause problem, but having both together causes even more troubles. Watch for Japanese beetle on “Silking” Corn. Japanese beetles feeding on corn silks. ﻿ Japanese beetles have been emerging over the last couple of weeks. With the general rainfall we had last Monday (6/11/12) this emergence is likely to quicken. 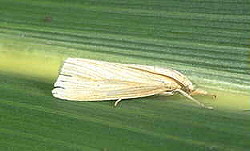 While this insect will feed on corn leaves, its’ only real importance is when feeding on emerging silks. This silk feeding can interfere with pollination resulting in incomplete kernel set. Figure 1. These insects are metallic green beetles about ½ “ long. They have a row of white tufts on either side of the body below the bronze wing covers. The beetles will congregate (sometimes in very large numbers) on ear tips and feed on the silks, thus preventing proper pollination. Normally, this insect is not a major pest of corn. However, in this year because of the mild winter and very warm spring the pest is emerging at an earlier date. Also, because of the dry soil conditions in the western part of the state, the emergence which is normally spread out in time, may occur over a much shorter period producing an unusually large number of beetles seemingly all at once. Scout for this insect by examining several individual groups of 20 consecutive ears. Determine if the silks have been clipped to within 1/2” in length. Additionally, count the number of beetles per ear and average these numbers for the twenty ears per sample, then average all the samples taken in the field. Treatment may be necessary if silks have been clipped to ½” and there are three or more beetles per ear. Current Flight Status: This pest is rare in the eastern half of the state and no moths have been captured in the Lexington trap this year. In Princeton, moths are being captured and these captures are increasingly greater than the rolling five-year average. Thus far, the Fulton county trap has captured the largest numbers and, like Princeton, the captures are increasing (at this writing 75 moths per week). Before the widespread use of corn products containing “B.t. corn borer traits”, the peak weekly captures were much greater. Consider the current 75 moths per week in light of the historic five- year average peak for 1999-2003 which exceeded 350 moths per week. In some years peak captures were in excess of 800 moths per week and it was not unknown to capture more than 1000 moths per week! With a few local exceptions it is unlikely that there will be widespread damage to corn from this pest. Nonetheless, infestation rates in a specific field cannot be predicted by captures in distant traps. One must scout those fields to know the pest level. Field corn products which contain “corn borer B.t. traits” will be largely protected from this pest. However, field corn refuges, sweet, pop and other food grade corns that do not contain “corn borer B.t traits” should be scouted for the presence of this pest. Figure 2. 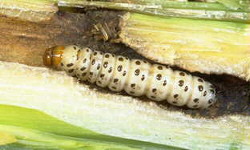 Southwestern corn borer larva (summer phase). Remember it is not the moths (Figure 1.) but ther the larvae aka caterpillars or worms (Figure 2.) that cause the destruction. Spraying when moth flight peaks is not really doing you any good. You need to wait until the larvae begin to appear. Using May 31 as a starting point (the peak of the current moth flight) a 50oF degree day model predicts that SWCB caterpillars should be showing up just abut now! In addition, you must treat while the larvae are still active in the whorl. Once they are in the stalk, foliar application will not provide control. Photos: R. Bessin, Univ. KY.
White Grub Damage Evident on Corn. 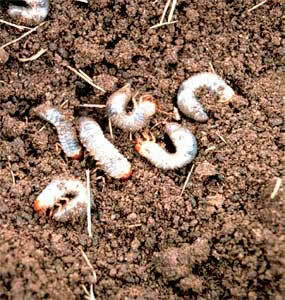 White grubs; photo courtesy of Iowa State University. Questions concerning corn root pruning by white grubs have surfaced across the state. A number of Ag. & Natural Resources agents have noticed typical damage and found white grubs in place, along with typically pruned roots. Certainly, given the drought status of most of our corn production area, it is within reason to believe that these grubs are placing an unusual stress on an already stressed crop. Early white grub damage typically appears as stunted, wilted, discolored, or dead seedlings and/or as gaps in rows where plants fail to emerge. White grubs prune roots and can feed on the mesocotyl causing plant death. Obviously we are far past this early damage stage. In larger corn, grub feeding simply prunes the roots resulting in the reduced ability to move water and thus nutrients. The plants simply have an unthrifty look. While there are some soil insecticides labeled for grub control, their control is somewhat erratic. These products must be applied before or at planting. No insecticides are recommended for rescue treatments. Even if soil applied rescues were available, we would likely need some rainfall to move the insecticide into the soil, especially in no-till. If we got the rain needed for that, we would have the rain we need for vigorous growth in the corn crop; which would likely outgrow the problem. Consequently, even though one might be looking for a pesticide remedy for this problem, what we really need is rain. In the presence of rain the problem is likely to go away. In the absence of rain…… well the damage just will not matter. There have been a lot of field challenges around the Commonwealth this season. Each week, I have been trying to update a set of images with problems and what we think the answers are. I have been circulating this with our County Extension Agents and they think we should share this with everyone. If we are seeing these problems, you may be as well. Just keep in mind, that these images are our best ideas about what is wrong in the fields. If you have suggestions or ideas, please pass those along to me. Thanks. Click here to access the pdf. I plan to update it about each week. Wheat harvest is underway in Kentucky and that means the 2012 Wheat Yield Contest is underway as well. The timing is early, by a couple weeks in some areas of the Commonwealth. That early timing be free up some time to enter the contest. To enter the contest, the field must be in Kentucky. At least 3 acres must be harvested for the contest. That 3 acres must be in one block and preferably with square sides. Any County Extension Agent is eligible to serve as a judge for the contest. If a County Extension Agent is not available, then another person involved in agriculture (such as an adult ag educator, FFA instructor, NRCS official, etc.) may supervise the yield entry, so long as that person is not a family member and/or involved financially with the contestant. Overall, the wheat plants are shorter this year. Many farmers are concerned about that. Jim Herbek and I blame the weather. The warmer season encouraged rapid development early, but not plant height. Those shorter heights probably will not affect final yields. The freeze damage in some areas did much more damage.